Published: Aug 24, 2017 · Modified: Apr 12, 2019 · By Jen Sobjack · This post may contain affiliate links. 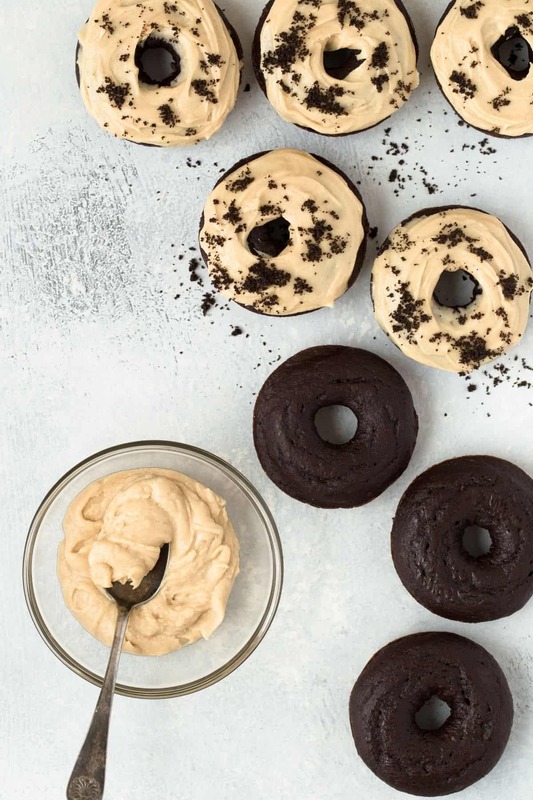 These Baked Chocolate Donuts with Peanut Butter Frosting will take you back to your childhood when things were simpler. They are a reminder of just how tasty breakfast can be. This chocolate donut recipe will give you the best baked donuts you’ve ever had. The recipe walks you through how to make donuts from scratch that are perfectly soft, chocolaty, and not overly sweet. These donuts are great for breakfast, brunch or snack any time of day! I am fully convinced that the only way to enjoy a chocolate donut is with peanut butter frosting. 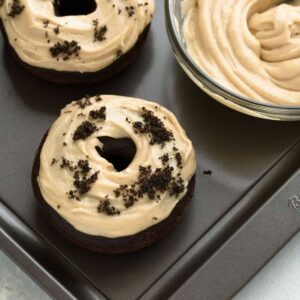 These chocolate donuts are perfectly balanced, lightly sweet, and decadent without being overly rich. The peanut butter frosting over the top makes them absolutely perfect all around. It’s a challenge to eat just one, so consider this your warning. This breakfast treat is so easy! It takes just a few minutes to put together and 10 minutes to bake. Overall, it will take you about 30 minutes to make the donuts. First, you need to whip up the decadent chocolate donut batter. That requires mixing the dry ingredients in one bowl and the wet ingredients in another then combining the two. Two bowls and a whisk. Those are the only tools necessary for this recipe. I used buttermilk and melted butter for an extra rich and tender donut. If you don’t have buttermilk, you can use sour cream or make your own buttermilk by adding a tablespoon of lemon juice to 3/4 cup of regular whole milk. I turned to cocoa powder for an intense chocolate flavor. And naturally, chocolate isn’t complete without its partner in crime – peanut butter. A thick creamy frosting made with peanut butter, butter, confectioners’ sugar, and heavy cream is slathered over the top of each donut. This is the ultimate flavor combination. Love baked donuts as much as I do? Check out this recipe for Strawberry Cake Donuts! 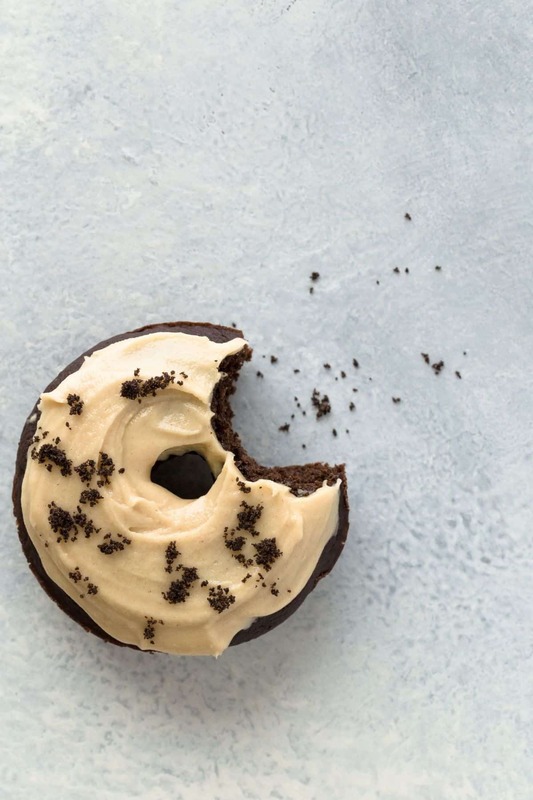 These Chocolate Donuts with Peanut Butter Frosting will take you back to your childhood when things were simpler. They are a reminder of just how tasty breakfast can be. This chocolate donut recipe will give you the best baked donuts you’ve ever had. Preheat oven to 350ºF. Lightly grease 2 donut pans with cooking spray. Set aside. In a large bowl, combine the flour, cocoa powder, brown sugar, baking powder, baking soda, and salt. Stir with a whisk. In a separate bowl, combine the eggs, buttermilk, and butter. Whisk until well combined. Add to flour mixture and mix just until moistened. Be careful not to over mix. The mixture will be thick. Pour mixture into a large zip-top bag and cut the corner off. Pipe the mixture into the prepared pans, filling each donut mold 2/3 full. Bake for 10-12 minutes or until the donuts spring back when touched. Allow the donuts to cool in the pans on a wire rack for 10 minutes. 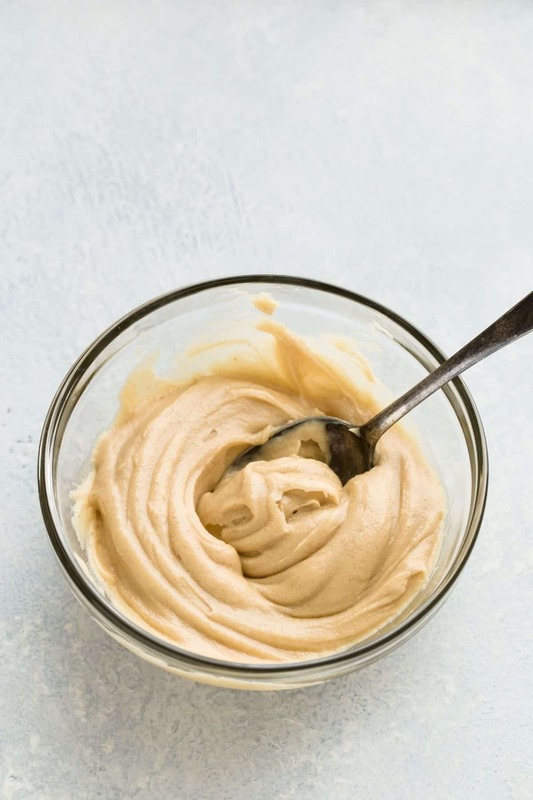 Place the butter and peanut butter in a small microwave-safe bowl. Microwave for 30 seconds. Stir vigorously to combine. Stir the sugar into the peanut butter mixture. Gradually stir in the cream one tablespoon at a time, stirring well after each addition, until the frosting is smooth. The frosting will be thick. Dip the tops of each donut into the frosting. Use the back of a spoon to smooth the frosting if needed. Store frosted donuts in an airtight container at room temperature or in the refrigerator for up to 2 days. The donuts can be stored in the freezer for up to 2 months. Thaw in the refrigerator overnight. I don’t have donut pans, but I do have a mini donut maker (shaped like the small George Forman Grill). Though I haven’t used it in a few years. Would this recipe work in this & how long would I let them bake? I’ve never used a donut maker so I’m unsure how this recipe will work in one. I just made these and didn’t have a donut pan. So I used my mini bundt pans, just filled them halfway and they turned out perfect. The recipe is so easy and quick to make. The donuts retained their shape when they came out of the pan and it all tasted great!!! I’m so excited that this recipe will be my base recipe for donuts and I can just mix and match icings when we don’t want peanut butter. FYI- the peanut butter icing is perfect on top so I’m not sure I would want to stray from it. Thank you!! That’s wonderful! I’m happy to hear they came out great in the mini bundt pans!! I’m all about baked donuts! I love this donut combination!! Sounds amazing! We love baked donuts and I’m always looking for new recipes. Can all purpose flour be substituted for the wheat flour? That should be fine but you may need to reduce the amount of liquid in the recipe since wheat flour is denser than all-purpose. Will these keep as well like the baked old fashioned donuts? Im searching for baked donut recipes that will keep for at least 2 days because I run a food cottage business and want to offer donuts at a local festival. Yes, they should. Make sure they are stored in an airtight container to prevent them from drying out. Is it equal amounts of the two flowers or is there a flour with both . Most super markets carry white whole wheat flour. Oh Jen! So sorry you are suffering with migraines! I had one once, and it blurred my vision so bad, I had to leave work. Good thing it was like 4am and I lived down the street from my work so I could still see enough to navigate my way home, but I would never wish that on anyone! I hope this new medication works out and the fatigue goes away! Sorry to read about your migraines Jen. I was getting them frequently as a result of stress so I know how debilitating they can be. I hope your new meds get everything squared away. Great donuts btw. They remind me of my child hood making donuts at grandma’s house. Oh man… hope you feel better soon and get that energy back! If you’re too tired to finish off a batch of these donuts, feel free to ship them my way… they look FANTASTIC!! I want me some of this aesomeness! Haha, there’s always energy to eat donuts! Thanks for your kind words, Chris. I’m so, so sorry about your headaches – that is no fun at all. And I’m the same – I definitely have a love hate relationship with doctors – I always delay going in, but am usually glad I did. I hope you are doing better. 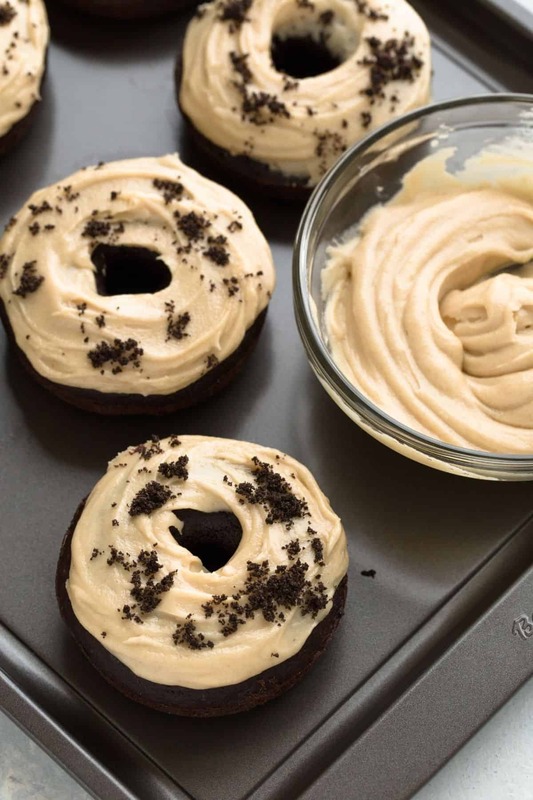 Gorgeous donuts – I love the chocolate + pb combo!! Thank you so much for your kind words, Chelsea! And for taking the time to stop by! 😀 Who could feel bad with chocolate and peanut butter, right?! Thanks, Maryanne. I do hope you can get yours under control. Migraines are brutal and I hate to hear that you have to deal with them too. Iced coffees and donuts are definitely things to make anyone feel better! can we just talk about how amazing these donuts are!!!!??? Yes! Let’s talk! These donuts are AMAZING! 😀 Thanks, Caralyn! I hope you feel better soon! These donuts are amazing, that glaze is to die for! They truly are a nightmare. I hate them! Thank you for your kind words, Allie. 🙂 Thanks for the compliments and pinning the donuts as well! I love everything about these donuts. They’re baked, they’re chocolate and that frosting – MMM, perfect. I too suffer from terrible migraines. I’ve seen 2 neurologists, got a MRI done and thankfully everything came back negative, but still I have headaches. My neurologist gave me a list of foods to try to to limit that causes them, I found a little help with it (so hard for me to not eat bananas though!). I also got subscribed pills, I put one under my tongue when I feel a migraine coming on. They seem to be the only thing that truly works for me. Good luck girl! I had a couple of CT scans done but never a MRI. They attribute my migraines mostly to allergies. I’m highly allergic to kitties and I have two. But they are elders and I don’t have the heart to rehome them. I should have done it years ago while they were still young, but at that time we didn’t know I was allergic. I try to limit my contact with them, my husband gives them enough attention for the both of us, and they are banned from our bedroom which seems to help some. Lack of sleep and alcohol are are major triggers as well. Luckily no foods set me off. So I’m just trying to keep my histamines low and take this new medication, while getting plenty of rest and trying not to stress to the point to where I want to drink, haha. I suffer from so many migraines that I think my name should be changed to migraine for reals. Well these look sensational and I need them in my life! You poor thing. I think I’ve only ever had on migraine, and I definitely thought I was dying. The nausea, the light sensitivity, then pain… I’m so sorry it’s a chronic problem for you! I hope the new meds help. And I hope those DELICIOUS looking donuts helped, too. I hope your new treatment will relieve you of your suffering, Jen. I love the donuts—peanut butter and chocolate is up there on my list of favorite food combos.. Thanks, Thao! Me too! I’m praying! Thank you so much for your sweet comment, Jennifer! WOW. These look awesome! And I love that they are baked. Now I just need to figure out a way to make them without a donut pan… HA! Thanks, Andrea! Girl, just go get a donut pan. LOL! I’m so sorry about your migraines. My friend gets bad migraines (when she eats chocolate – tragic, I know), and she swears acupuncture really helps! Also, these chocolate peanut butter donuts looks amazing. My gay roommate loves both chocolate and peanut butter. I’m convinced he’d convert and marry me if I made these for him! Thank you, Connie! I feel blessed that chocolate isn’t a trigger for me. Acupuncture, huh. I may have to give this some thought. You’re roommate better watch out, these donuts are life changing! I’m sorry to hear about your migraines Jen. Hopefully these new meds help and the size effects diminish. Love baked donuts and these are gorgeous! Pinned! Thanks so much for your kind words and the pin, Mira! Girl, the frosting is the best! Feel better soon Jen and take it easy. I know how it can be with migraines. I’ve suffered from them since I was 16. On a happier note, these donuts look lovely and the addition of peanut butter frosting is a nice touch. And these donuts look beyond gorgeous! Love the chocolate and peanut butter combo! The frosting is totally calling my name! They’re such a nightmare! I’m sorry you have to deal with those nasty devils too. I wouldn’t wish them on anyone. Thanks for kind words and warms hugs. I’m feeling positive about the preventative meds. I just have to get adjusted to them. Have a great week, Kelly! Aww…I hope you feel better soon Jen, headache can be horrible! Please take care! 🙂 The donuts look amazing, you are the baking queen! Pinned! Baking queen? You’re crazy, lol. But seriously, thank you for the lovely compliment and well wishes! Have a wonderful week, Manali! Yes please!! I will take a dozen! I’m so sorry you suffer from migraines! That’s the worst. I’ve never had one, but I cannot imagine! I so worry that my daughter will end up with them, she gets often gets headaches that make her sick (and she’s only 10!) I do love these donuts – that frosting is the best! Mmm chocolate and peanut butter is my favorite combo, so these are right up my alley!! They look delicious, pinned! Thank you for pinning, Rachel! Ugh, debilitating headaches are the absolute WORST. Definitely hoping you feel better asap, Jen! I know it’s no fun. HUGS. And these donuts?! Gahh just gimme the whole batch and a bowlful of that peanut butter frosting and I think I’m set for the day. 😉 Pinned! I get stress headaches all the time, so I know what you’re going through! These donuts look delicious, Jen! Your pictures are gorgeous! Makes me want to reach through the computer screen and grab one, especially with all of that peanut butter frosting on top! Pinned!